Location: Opposite Hill Street at the centre of the village. Erected c1920. White marble. A square section column on a stepped base carries the statue of a soldier leaning on a rifle. Inscriptions in leaded letters carried on shaped panels on the column, and on the base. 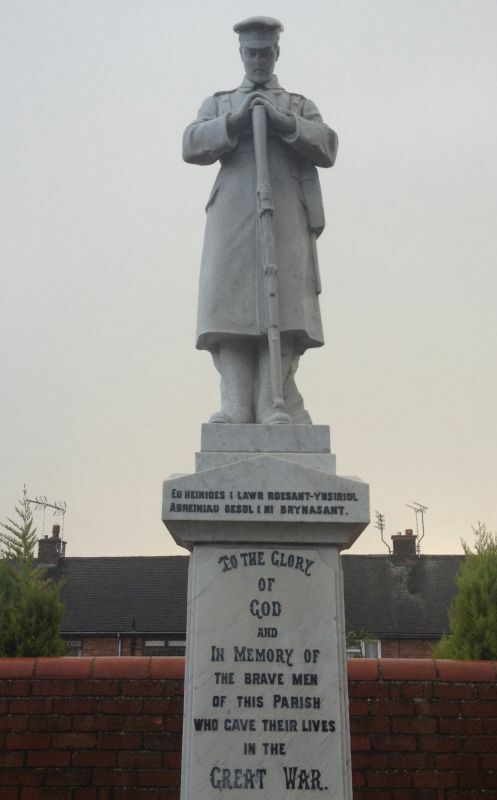 A typical example of a war-memorial which is a prominent feature of the village centre. Close to the junction of Church Street and Bridge Street, at an angle to the road. At the upper, south-western end of Penycae. Situated above and beyond the church on the south-western edge of Penycae. On the corner of the B5097 Ruabon road and Plas Bennion Road, at the SE end of the village. Entered via a former byre in the former farmyard immediately SE of Wynn Hall.